Dwi Rahmad Muhtaman graduated with a degree in Social Economy from IPB in Bogor and got a Master’s degree from Auburn University in Public Administration. He has considerable experience in project planning & management, sustainability assessment and appraisal in Indonesia, having been involved in numerous studies and consultancy projects over the past 20 years. 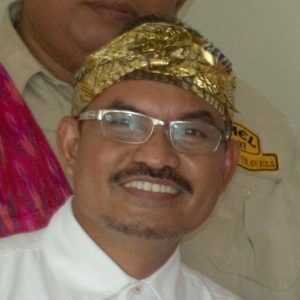 He is especially knowledgeable in the area of forest certification, HCVs assessment, eco-labeling, socio-economic analysis, and social audits and has been involved in the development of HCVF toolkit for Indonesia and its audit/assessment. His particular expertise lie in forestry issues, especially with regard to the social aspects thereof. Dwi is a member of Technical Panel of HCV Network based in Oxford, UK and founder and Chairman of Executive Board of Jaringan Nilai Konservasi Tinggi Indonesia (HCV Network Indonesia). For the last 20 years he has been included as the social expert on several certification forest audits/assessments for both plantation, natural forest concessions. For the last five years Dwi has been participating in variety of oil palm plantation assessment for social and environmental standards including RSPO standards. Dwi has also been involved in HCV identification as lead assessor approved by RSPO, Social Impact Assessment (SIA), and Café Practices verification program. Dwi is the founder of Aksenta Consulting—a consulting group and socio-enviro enterprise; Dwi is founder and Director of PT Re.Mark Asia.